A rod transmits clear messages through the handle to your hands. Do you know what your rod is saying? Casting without having a proper target to aim at is one of the biggest mistakes you can make. Look out to sea in the direction you want to cast, and imagine a target in the sky at about 45 degrees elevation and a little to the right of the casting direction. These angles are only a guide. Just remember that to cast straight and far you must cast high and slightly right. If you aim straight towards where you want the bait to land, casts tend to fly low and left usually losing power and control along the way. Trap the leader with your index finger, open the bale arm… and let fly. Using a fixed-spool is that simple. Tuck the metal stalk that connects the reel body to the rod between your second and third fingers to provide a firm grip, positioning the index finger above or slightly behind the spool for best control. Lock the spool before you cast, otherwise the leader will slip under pressure and slice across your finger like a bandsaw blade. Some anglers tighten the drag before each cast then re-set it to a lower pressure for safe fishing. Others lock the drag permanently and release line by winding the handle backwards. Essential checkpoints before casting: Leader knot tucked to one side of the spool; a good solid grip, most easily accomplished by wrapping the thumb around the spool. And it helps to put the reel out of gear, which we all forget to do now and again! Thumb protection is useful, especially in cold, wet weather. A snug-fitting ring of rubber cut from the finger of a washing-up glove does the trick. Success with the multiplier is all about confidence. The more nervous you are about over-runs, the worse they get. 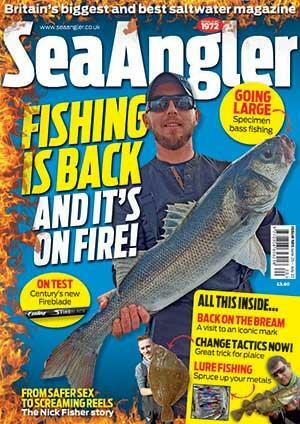 The new beach angler’s priority is to cast far enough to give a reasonable chance of catching fish. Style does not come into it. We need a fuss-free system, quick to learn and reasonably efficient. For good distances and smooth control, start the cast with the sinker lying on the beach. A compact offground method involving no more than a flick of the arms will drive a baited rig well over 100 yards. Why? Because it makes the rod work. To cast well, a rod must be swung through an arc in a two-step process. The first step is to bend the blank into a spring-like state so that it stores energy. As it bends, the rod blank stiffens to become a solid lever. You must be hitting against firm resistance when the arms finally push and pull to drive the cast skywards. Big trouble and small distances are the inevitable result of hitting an uncompressed rod – and the common overhead thumping style is proof of that. To cast powerfully and smoothly it is essential not only to stand comfortably but also to be properly aligned with the target. The basic stance is quickly discovered by swinging the rod as if it were a hammer. Imagine that the tip ring is the hammer-head. Hit towards the aerial target using exactly the same pushpull arm action that you would use with a long-handled hammer. It’s really that easy. Notice that your stance took care of itself. Most people’s feet settle at about shoulders’ width apart. If a line were drawn through the heels, it would angle slightly to the left. This natural stance allows the body to work efficiently – and what works for hammering is excellent for casting as well. This cast uses a relatively small arc and gets most of its power from the arms, so how can it produce the initial spring-like loading that turns the rod into a firm lever? Since there is only a small amount of rod movement between the cast’s layout position and the point where the arms must begin working, the only solution is to make the rod load heavily and rapidly. This is achieved by laying the sinker on the beach in a high inertia position almost alongside the blank. The layout shown in the diagram works well with most tackle, but you should experiment with leader lengths and sinker positions to find the best combination. Look at the imaginary mid-air target and shuffle your feet into position. Turn away from the water and lay the sinker on the beach ready for lift-off. As you turn, hold the rod at comfortable arms’ length so that you feel neither cramped nor over-stretched when the tackle is in position. Rod, leader and sinker lay-out must be the same for each cast unless you deliberately make changes, so it helps to mark their starting positions on the sand. Two important checks are rod tip and left elbow heights (assuming a right-handed caster). The tip ring should almost touch the beach. The elbow is held high, so that to somebody watching from the side it would appear that the left forearm was a straight extension of the rod handle. Unless these points are correct, the rod arc will be too short to pre-load the blank and the arms cannot hammer properly. Having turned away from the sea and laid out the tackle, notice that in the meantime your body weight has shifted towards your right leg. This happened naturally. There is no need to think about it as you set up the cast... it happens naturally. When the cast is set up and ready to go, check that the weight remains biased towards the right foot. This pressure tells you that the casts set up is correct – and there is more to it than that. … slide your body weight towards the left leg. The combined head turn and weight transfer triggers the cast. Your arms do absolutely nothing to control or add power at this point. This is a vital point to understand. Do it right and there will be a momentary sensation of your body leaving the tackle behind, accompanied by a feeling of the rod becoming heavier and stiffer. As you become more familiar with the cast, you will feel that the rod’s first movement is similar to the action of throwing a spear. What happens is that the body weight sliding over to the left foot makes your upper body unwind towards the water. The rod lags for a moment then follows the shoulders. The sinker resists strongly, compressing the rod blank into a lever. All this happens automatically. Focusing on the target keeps the action going forwards and upwards. As the body unwinds and the rod follows, there comes a moment when it feels right to make the hammering action. Go ahead and do it. Push and pull to flick the rod over and drive the sinker towards the target in the sky. Line release takes care of itself with no deliberate timing involved. In the early days, use the natural hammering action where both arms contribute equal power. Later, when casts flow smoothly and the drop length and sinker positions are more refined, increase left-hand pull. This little off-ground cast with its high inertia sinker lay-out responds extremely well to lots of left-hand power. A 2:1 pull-push ratio is by no means too severe. It’s an excellent way to extract smooth performance from a stiff, quick rod. It also makes a cast fly high, which is a very good thing when you are learning the game. Casting on autopilot can be disconcerting, but you must fight the natural urge to over-analyse and control every step. Think simple. The entire cast can be summed up in a few key words: identify the TARGET, TURN away from the sea, lay out the TACKLE. Slide your WEIGHT over to the left foot while turning your HEAD towards the target. FEEL the rod compress, HAMMER the cast into the sky. When a fixed-spool cast hits the water, crank the handle to close the bale-arm. Wind loose line back on to the spool under proper tension. Backlashes at the end of a multiplier cast are common until you master the art of stopping the spool at the right time. Clamp down with your thumb when you see the tackle hit the water. Err on the quick side if anything. Experience will teach you to monitor the cast by feel, sight and sound. There is a unique blend of line pressure and reel noise that tells you exactly when to stop the spool. Controlled that way, multipliers are easy to use even at night. Anglers who started out with the overhead thump almost always try to cast too quickly and much too hard. This is a mistake with any efficient style, and particularly destructive with a high inertia technique. Half speed is usually quite quick enough, and the power needed to cast 100 yards is remarkably little. Done reasonably well, this small cast will comfortably exceed 100 yards with a 5oz/150gm sinker. This is plenty far enough to catch fish. Rather than thrash for a few extra yards, concentrate on learning to feel the rod working as it moves through its spring-and-lever stages. A rod talks to you by transmitting a clear message through the handle to your hands. Understanding rod-speak is a vital prelude to mastering advanced styles such as pendulum.